Players wanting to steal a march over their competitors in the global oven bags and pouches market are focusing on product development. The market at present is seeing an upswing on account of the changing lifestyle of people worldwide which has driven up demand for convenient packaging solutions. Since oven bags and pouches are easy to use and can withstand temperatures up to 220-degree centigrade, they are seeing swift uptake. Hampering demand for oven bags and pouches, on the other hand, is the concerns about the health hazards presented by them on account of the migration of the volatile and non-volatile organic compounds from the oven bags to the food items placed in them. Emergence of new products such as stand-up ovenable pouches is however helping to overcome such challenges by opening up new avenues of growth. 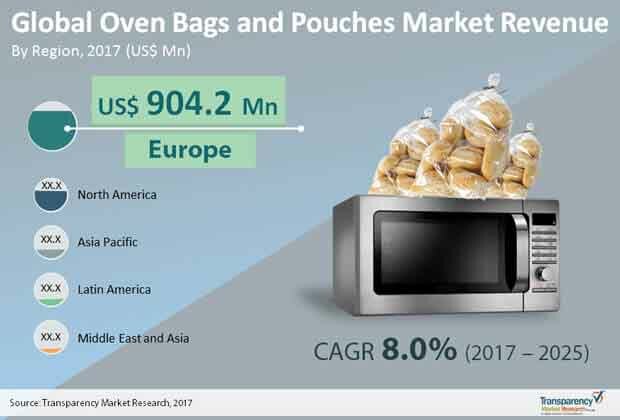 A report by Transparency Market Research forecasts the global oven bags and pouches market to rise at a steady CAGR of 8.0% from 2017 to 2025 to become worth US$3.9 bn by the end of 2025 from US$2.0 bn, in 2016. Material type, packaging type, packaging size, sales type, seal type, end use, and region are some of the parameters based on which the global oven bags and pouches market has been segmented. Depending upon the type of material, for example, the main segments of the market are nylon, PET, aluminum, and others namely PP, PE, etc. Of them, nylon is popular in North America and Europe and is projected to grow its market share by registering a CAGR of 8.4% from 2017 to 2025. The segment of PET is again expected to rise at a CAGR of 8.2% in forecast period. On the other hand, aluminum and other materials are anticipated to shed some of their market shares owing to the health hazards they pose. Based on the type of packaging, the global oven bags and pouches market can be classified into bags and pouches. Currently, the segment of bags leads the market because of their widespread use in food processors and also by individuals. The pouches segment gained noticeable market share in the recent years due to introduction of ready to eat meals in ovenable pouches. The pouches segment is estimated to witness a CAGR value of 8.5%, in terms of value, over the forecast period. From a geographical standpoint, Europe dominates the global oven bags and pouches market vis-à-vis both value and volume. The region is predicted to consume 3,682,045 thousand units of oven bags and pouches by 2025-end. In terms of value, the region will likely clock a CAGR of 7.4% from 2017 to 2025 to attain a value of US$1.60 bn by the end of the forecast period. Europe currently accounts for an estimated 42.5% of the global oven bags and pouches market, in terms of value. Vis-à-vis growth rate, the Middle East and Africa is predicted to surpass all other regions by rising at a 10.2% CAGR during the forecast period. The region, along with South Africa is expected to see rising demand for oven bags and pouches on the back of changing consumer preferences towards ovenable packaging solution. Asia Pacific too will see impressive growth – around 9.8% CAGR from 2017 to 2025 – to reach a value of US$450.6 mn by the end of the forecast period. Some of the noteworthy players in the global oven bags and pouches market are S. C. Johnson & Son, Reynolds Group Holdings Ltd, Sealed Air Corporation, Mondi Group, Berry Global Group, Inc., The Clorox Company, and DuPont Teijin Films U.S. Limited Partnership. This report provides forecast and analysis of the oven bags & pouches market on global level. It provides actual data of 2016 along with estimated data of 2017, and forecast data up to 2025 in terms of revenue (US$ Mn) and volume (‘000 Units). The report also includes macroeconomic indicators along with an outlook on oven bags & pouches consumption pattern across the globe. It includes drivers and restraints of the global oven bags & pouches market and their impact on each region during the forecast period. The report also comprises the study of current issues with end users and opportunities for oven bags & pouches manufacturers. It also includes value chain and pricing analysis. In order to provide users of this report with comprehensive view of the market, we have included detailed competitiveness analysis and company players with their SWOT analysis and strategy overview. The dashboard provides detailed comparison of oven bags & pouches manufacturers on parameters such as operating margin, total revenue, and product portfolio. The study encompasses market attractiveness analysis by material type, by packaging size, by packaging type, by sales type, by seal type, by end use, and by region. TMR triangulates the data via different analysis based on supply side, demand side, as well as dynamics of oven bags & pouches market. The report includes consumption of oven bags & pouches and the revenue generated from sales of oven bags & pouches across the globe and key countries. By material type, oven bags & pouches market is segmented into Nylon, PET, Aluminum, and Others. By packaging size, oven bags & pouches market is segmented into less than 150X280 mm, 150X280 mm to 250X380 mm, 250X380 mm to 350X480 mm, and more than 350X480 mm segments. By packaging type, oven bags & pouches market is segmented into bags and pouches. By sales type, the market is segmented into institutional sales and retail sales. By seal type, oven bags & pouches market is segmented into adhesive seal and heat seal. By end use, oven bags & pouches market is segmented into meat, poultry, seafood, ready-to-eat meals, and vegetables and others. Ready-to-eat meal segment is further subdivided into pre-prepared meals, frozen food, pasta & pizza, and burgers, sandwiches, and others. Market numbers have been estimated based on extensive secondary and primary research, average pricing of oven bags & pouches by packaging size and the revenue is derived through regional pricing trends. Market size and forecast for each segment have been provided in the context of global and regional markets. The oven bags & pouches market has been analyzed based on expected demand. Prices considered for the calculation of revenue are average regional prices obtained through primary quotes from numerous regional oven bags & pouches manufacturers. All key end users have been considered and potential applications have been estimated on the basis of secondary sources and feedback from primary respondents. Country demand patterns have been considered while estimating the market for various end users of oven bags & pouches in the different regions. Bottom-up approach has been used to estimate the oven bags & pouches market by regions. Global market numbers by material type, by packaging size, by packaging type, by sales type, by seal type, by end use industry have been derived using the bottom-up approach, which is cumulative of each country’s demand. The same has also been validated from top-down approach. Company-level market share has been derived on the basis of revenues reported by key manufacturers. The market has been forecast based on constant currency rates. The report provides detailed competitive and company profiles of key participants operating in the Global market. Key Players of the oven bags & pouches market are S. C. Johnson & Son, Reynolds Group Holdings Ltd, Sealed Air Corporation, Mondi Group, Berry Global Group, Inc., The Clorox Company, Bemis Company, Inc., DuPont Teijin Films U.S. Limited Partnership, Gr. Sarantis SA, M&Q Packaging, LLC, The Schur Flexibles Group, FFP Packaging Ltd., Sunkey Plastic Packaging Co. Ltd, Sirane Limited, Flexopack SA, Planit Products Ltd., Clifton Packaging Group Ltd., TCL Packaging Ltd., Aalmir Plastic Industries LLC, Terinex Ltd.